Customers of Golden State Water Company in Ojai have fought since before 2013 to switch to a different water provider. Water rates have dropped by as much as 65 percent in Ojai after Golden State Water Company was essentially fired by its customers in a 2013 election vote that raised a $60 million bond to buy it out via eminent domain. But the road between then and now was paved with lawsuits and appeals, culminating in a bill sponsored by Assemblymember Monique Limón that officially took Golden State off the governing board of the Ojai Basin Groundwater Management Agency on July 9. It’s now up to the board to find a replacement boardmember, who must be from the area formerly served by Golden State. 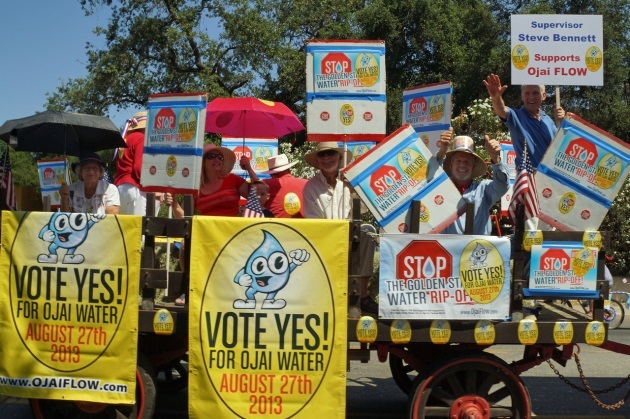 After the grassroots group Ojai FLOW (Friends for Locally Owned Water) and an 87.4 percent vote by water customers approved Casitas Municipal Water District as their new water provider, Golden State resisted. It filed lawsuits and appealed when it lost, including to the California Supreme Court, which refused to hear the case. The appeal papers state that the private water company charged more than double Ojai’s two municipal providers: Casitas and Ventura River Water District. For all the money it got, Golden State left a water system that was “decrepit, in very, very bad shape,” said Russ Baggerly, a member of the groundwater agency board and the Casitas water district. As a member of Ojai FLOW, Bob Daddi had complained to the Public Utilities Commission to no avail. He and six other residents of the small community formed the nonprofit, studying the issue for about four years before making an appeal to the public. They got an education from Felton FLOW, formed in a community near Santa Cruz that had also been at the mercy of a private water company. The Ojai group created a website and held meetings, said Daddi, who also owns the Ojai Valley News and a State Farm agency. They made sure they understood the legal underpinnings of an eminent domain action before approaching the bond vote. A settlement with Golden State in 2017 finally turned control of the water system over to Casitas. In a single year, said Daddi, 115 leaks had sprung up in the 90-year-old system in 2009-2010; about 15 percent of its water was lost through leaky pipes and valves. The bond money remaining from the $34.5 million settlement agreement will go to fixing infrastructure like wells and other capital improvements, said Baggerly. The switch to a municipal water provider — which is not subject to corporate and property taxes, he said — has saved the 2,950 customers a collective $3 million per year. The resident who takes the vacant board seat on the Ojai Basin Groundwater Management Agency will have oversight of the water collecting deep under Nordhoff Ridge — Ojai has the second fastest water recharge basin in America, Bob Daddi boasted — and Daddi believes it should be an Ojai FLOW member. “We directly represent the individual property residents,” he said. “After all, whiskey’s for drinking and water’s for fighting,” he added, grinning. Editor’s Note: This story was revised on August 13 to clarify that the 115 leaks occurred in 2009-2010, not after control was turned over to Casitas.